Over the years, higher education has experienced a variety of shifts, some qualifying as seismic (such as admitting women), others deserving more modest descriptors (for example, electronic textbooks). Add to the seismic column the distance learning classroom. Yet even that arena of growth has seen variations that now may seem tame; for example, distance learning programs have a surprisingly long history, as this graphic from the website Straighterline illustrates. In my own lifetime as a composition instructor, I have witnessed the growing demand for online course offerings – and with that growth tensions between pedagogy and university business models. However, the field of English Studies appears to be progressively engaging this trend, if publication records are any indication. (See this link for the CCCC annotated bibliography on online writing practices.) A thread in this conversation appears to invite intense scrutiny, and is my chosen Object of Study for this course: MOOCs, or Massive Open Online Courses. “What Is A MOOC?” EdTechReview. Image and video. 15 March 2013. MOOCs, simply defined, are typically tuition- and credit-free classes offered online to any and all interested students, using a variety of methods which include recorded short lectures, discussion boards, and asynchronous activities, depending on the subject matter. Specifically, I plan to examine Composition MOOCs, as writing courses – especially freshman writing – are problematic areas of study given the established theories of best practices that have evolved in concert with our field’s evolution into digital spaces. The subject matter seems especially useful as an object of study given that many discussions of the online or digital classroom in our field often reflect tensions associated with the history of our field’s quest for professionalization. Given the nature of MOOC-based learning systems, questions of best practices and integrity of degree programs are likely to be part of any network. The demand for online higher education course offerings comes from a variety of sources and stakeholders. The unique characteristics of MOOCs, however, offer additional challenges, many of which mirror common discussions within our field: assessment, access, instructor training / qualifications, questions of labor, plagiarism, student engagement, retention, and pedagogy. Given recent attention paid to the trend of MOOCs by higher education publications (see resources list below), it would appear that this is an area of debate and activity that may promise productive research. For example, MOOC-based composition courses, such as that described in a paper being presented by Sherry Jones’ and Daniel singer at the 2014 CCCC on incorporating gaming in the classroom, also open up new potential for digital pedagogy. Given the inherent structural nature of MOOCs, it seems self-evident to approach this Object of Study as a network. However, I believe the network (the rhetorical situation of this study) must incorporate more than the rather obvious element of online connectivity among students and teacher. There is the “incorporeal discourse” of which Foucault writes (24) – and what Biesecker might link to Derrida’s concept of “différance” in discussions of rhetorical situation — which might be explored through consideration of the structural / mechanical, economic / business, as well as pedagogical discourses. In short, the network concept offers a way to connect stakeholder discourses with those of the technical and the pedagogical. As I am largely unfamiliar with MOOCs, opportunities for discovery and exploration are rich, and I anticipate unexpected nodes and layers emerging as I progress. “What is a MOOC?” A Video Explanation. 10. 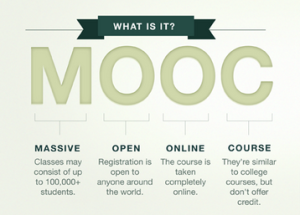 “What Is A MOOC?” EdTechReview. Image and video. 15 March 2013.